Find out how you can get a high quality Amana furnace or air conditioner rental in your home today! Why choose Amana for your next rental? Amana has a variety of heating systems with up to 98 per cent AFUE (Annual Fuel Utilization Efficiency). That means that for every dollar you spend, 98 cents goes directly towards heating your home. The higher the AFUE rating. The more energy savings you will see on your monthly bill! Some systems offer compatibility with ComfortNet Communicating systems. This feature allows for a LCD touch screen customization for programmable temperature changes. You can also monitor performance and get scheduled maintenance alerts. Amana furnaces are insulated for reduced noise. This allows a quiet comfort operating system that allows you to enjoy the benefits of a high efficiency gas furnace rental, without the noise associated with other brand models. 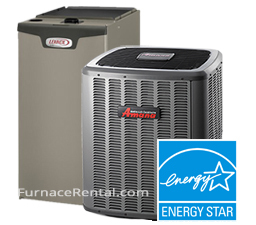 We carry a whole range of Amana models available in our Furnace Rental program. Amana offers a variety of central air conditioning units with a SEER (Seasonal Energy Efficiency Ratio) of up to 24.5. This rating is a direct reflection of how much you can save each month on your energy bill. The higher the rating, the larger the savings. Amana knows that you want to be able to enjoy your home without the disruption of a loud unit, so they have manufactured their systems with compressor sound reduction cover made of high density foam complimented with a sound control top. This means you get all the benefits of a comfortable home without the annoying buzz of a loud outdoor unit! Many systems are also compatible with Amana’s ComfortNet Communicating systems which offer a touch screen LCD system to allow you to schedule temperature changes, monitor system performance and be alerted for regular maintenance. Ductless heat pump rentals offer the best of both worlds-heating and cooling in one unit! Amana has also combined some of their best innovations to make their pumps some of the most energy efficient offering up to a 21 SEER (Seasonal Energy Efficiency Ratio). This translates to real savings on your energy bills each month. Some units are compatible with ComfortNet Communicating systems. Temperature changes, performance monitoring and scheduled maintenance are available using LCD touch screen technology. Amana heat pumps are also designed for reduced noise production. The units feature a high density sound reduction cover for the compressor complimented by a sound control top. That means that you don’t have to sacrifice the comfort of your yard for the comfort of your home. When it comes to quality high efficiency gas furnaces and central air conditioning units, the name Amana definitely comes to mind. Looking at the company’s beginning, it’s no wonder we see so many Amana gas furnace and air conditioning rentals in homes all over North America today. Named after the hometown of its founder, George Foerstner, Amana products began in the namesake Iowa town when Foerstner was challenged to create a dependable beverage cooler. He was able to rise to the occasion and two years later, innovated the walk in beverage cooler. This new type of cooling system became indispensable to the local grocery and restaurant businesses. This success led to the branching out to the production of various commercial and residential appliances, making Amana a household name. By the time Amana began manufacturing heating and cooling systems, their reputation for quality and innovation led to continued success with their high efficiency gas furnaces and air conditioning units. Made in the United States, and widely sold in Canada, the name Amana is synonymous with quality, innovation and pride of ownership. You can afford a Amana rental in your home! With such high quality features, many may feel they cannot afford a name like Amana, but luckily there is now a new way to get high quality heating and cooling products in your home with no upfront costs, and flexible approval! High efficiency heating and cooling systems add value to your home or business. Not only do you save on your energy bills but your home is more attractive for resale. A rental agreement is easily transferred between owners. We offer FREE installation as soon as the next day. You installation not only includes your new energy efficient unit, but up to 15 feet of duct work! We will also remove your old unit without for free! All it takes is a phone call to get started. Your rental agreement includes regularly scheduled maintenance to make sure that your unit continues to operate as efficiency as possible. Any issues with your heating or cooling unit can be solved with a simple phone call to our service line. Instead of wasting time calling around for the best price, you have access to our 24/7 helpline where you will receive expedited help to your home. If we can fix your issue, we will replace your unit, completely free. This agreement is a great option for property owners. The rental fee can easily be incorporated into your monthly rental costs and tenants have easy access to service for their units 24/7. High efficiency systems are attractive to tenants seeking lower energy costs and rental agreements require no money upfront. Business owners can easily build their annual budget around a fixed costs, without having to worry about unexpected service or maintenance costs throughout the year. So what are you waiting for? All it takes is a few minutes to get started on your way to energy savings. With free installation, removal of your old unit, flexible approval and no upfront fees, you have nothing to lose. Call us today for a quick and easy quote on a new rent to own Amana system at 1-877-785-1055. You will simply gain a new high efficiency heating and cooling system, and a better peace of mind knowing you don’t have to worry about maintenance and service fees.